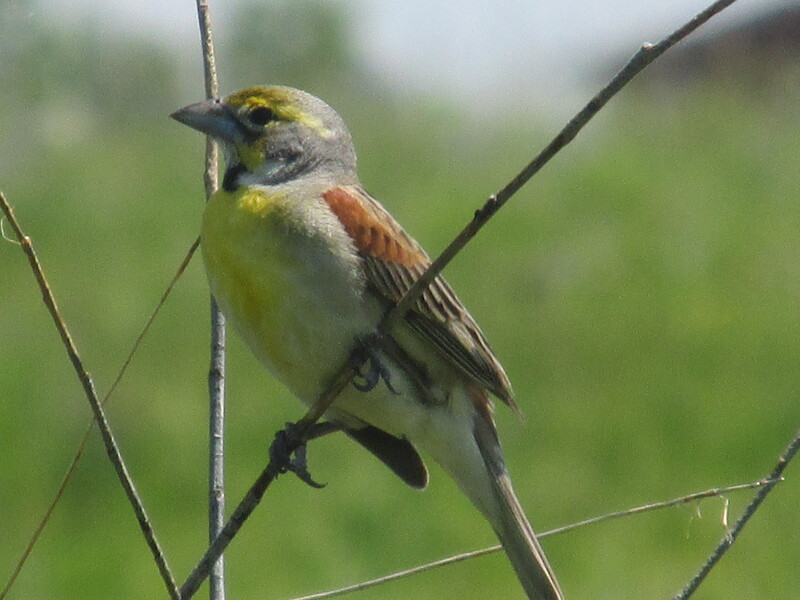 If there’s one thing you learn on a prairie, it’s that the more you begin to know about the bugs, blooms, and grasses, the less you realize you know. And the more you realize you don’t know, the more you want to know about what you don’t know. I looked up, hip-deep in creek water, hoping to see the former owner of the feather. The only bird in sight was this kingfisher. Hmmm…doesn’t seem to match. Back to the bees. Or is this a bee look-alike? I look at the markings on the head, the tuft of fur behind the, um—neck? Is that the right term?—and the patterns as seen from topside. I still am unsure. So many native bees and non-native bees! So many bee look-alikes! The mind boggles. The sunflower this bee is busily investigating is the woodland sunflower, Helianthus divaricatus. At least, I think that’s what the flower is. Does anyone else find the sunflower family confusing? Later, I asked the bee researcher, who was shoulder-deep in the sunflowers, if he knew which species it was. He shrugged. So many All-Star prairie wildflowers. And don’t get me started on the skippers. For my birthday this month, my wonderful husband gave me a terrific pair of close-focus binoculars and an out-of-print guide to Illinois skippers—all 59 local species. They’ve both helped. But even the skippers on the prairie seem astonished by their own complexity. Silver-spotted skipper? I think so. The field guide says they are pretty common. 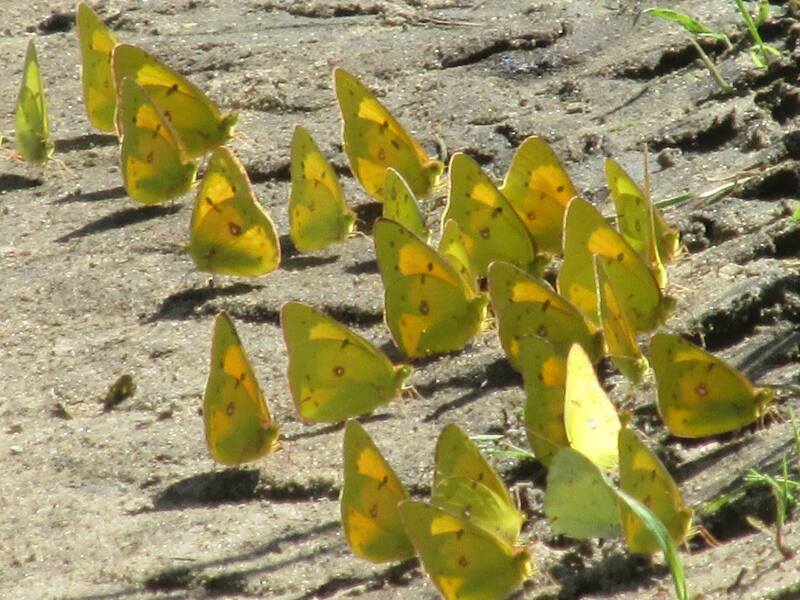 But it’s going to take me a while to get a handle on the skippers and butterflies in my little corner of the world. 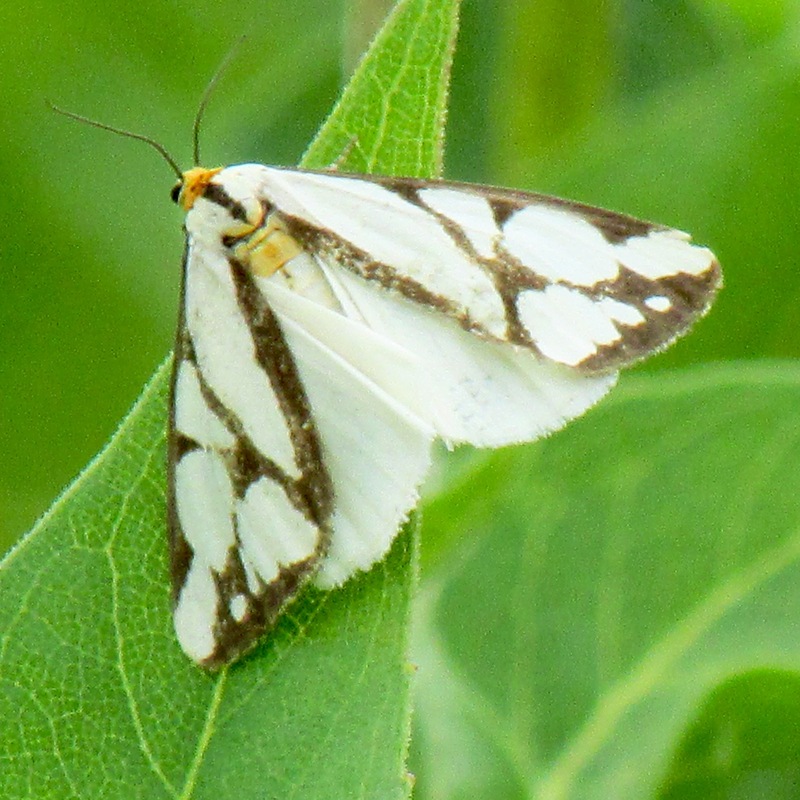 At least there is no “question” about the identity of this beautiful butterfly. This week, I’m teaching “Dragonfly and Damselfly ID.” It’s guaranteed to be an exercise in humility. No matter how many of the dragonfly and damselfly species that I know—and I’ve learned quite a few over the past 13 years as a monitor—it’s a good bet there will be some oddball that shows up and doesn’t fit any description of a damselfly I’ve seen before. The meadowhawks are particularly confusing at this time of year. This one below is likely an autumn meadowhawk because of the yellowish legs. Likely. I’m pretty sure—at least, I think that’s what she is. However, there are red meadowhawk dragonflies zipping all over the prairie, and their immature counterparts which are yellow-ish, and the females which are sort of gold, and it all begins to blend together. Their red counterparts are even more confusing. Cherry-faced meadowhawk? Ruby meadowhawk? White-faced? I think I see some reflected amber patches on the leaf. So I check the field guide— most of the red meadowhawks have them. My “unknown meadowhawk dragonfly” column on my data sheet is getting bigger each week. For my class, I’ll hope for the old familiar favorites, like the male calico pennants with their row of luscious red “hearts” in a row down their abdomen. And back to those wildflowers. Wow! They keep me up at night, flipping through plant ID websites, dipping into Flora of the Chicago Region, trying to understand what it is that I’m seeing and how it fits into the community we call prairie. 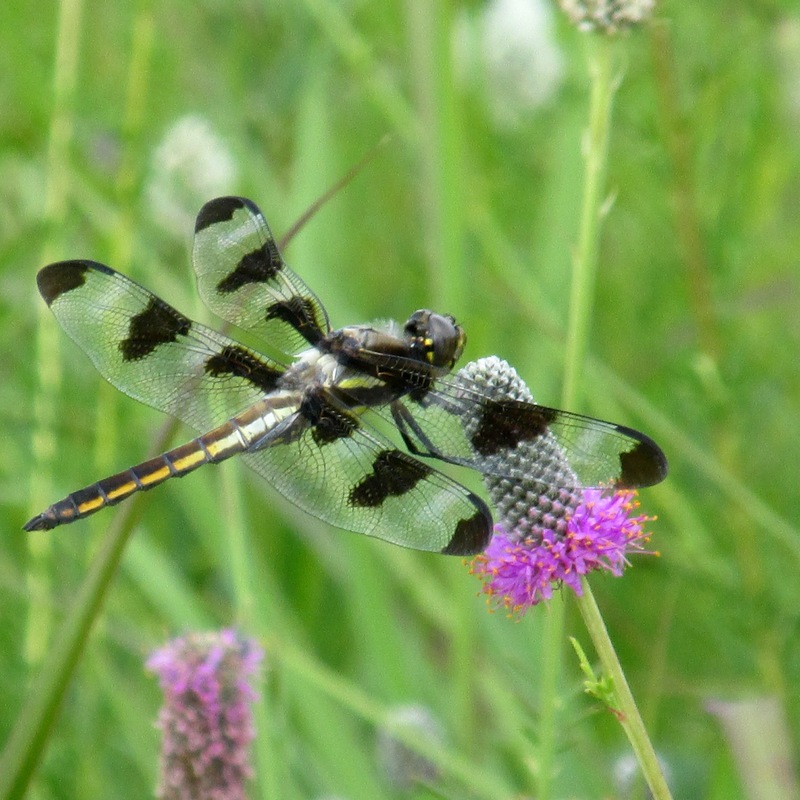 Nachusa Grasslands, where I’m a dragonfly monitor, has more than 700 plant species! How do you wrap your head around that? What a beautiful problem to have, isn’t it? So many “All-Stars” on the prairie. So much to discover. Whenever I get frustrated at all there is to learn about in the tallgrass—and marvel that I’ve learned anything at all—I take a moment to sit on the bridge over Willoway Brook and be quiet. Clear my head. As I reflect, I realize what I don’t know doesn’t matter as much as showing up. Listening. Thinking about what I see. All photos and video clip copyright Cindy Crosby (top to bottom): July at Nachusa Grasslands, The Nature Conservancy, Franklin Grove, IL; bee on a feather, Nachusa Grasslands, The Nature Conservancy, Franklin Grove, IL; kingfisher (Megaceryle alcyon) over Clear Creek, Nachusa Grasslands, The Nature Conservancy, Franklin Grove, IL; unknown bee on woodland sunflower (Helianthus divaricatus), Nachusa Grasslands, The Nature Conservancy, Franklin Grove, IL; July wildflowers, Nachusa Grasslands, The Nature Conservancy, Franklin Grove, IL; silver-spotted skipper (Epargyreus clarus), Nachusa Grasslands, The Nature Conservancy, Franklin Grove, IL; question mark (Polygonia interrogationis), Nachusa Grasslands, The Nature Conservancy, Franklin Grove, IL; autumn meadowhawk dragonfly (Sympetrum vicinum), Nachusa Grasslands, Franklin Grove, IL; unknown meadowhawk dragonfly (Sympetrum), Nachusa Grasslands, Franklin Grove, IL; calico pennant dragonfly (male) (Celithemis elisa) Schulenberg Prairie, The Morton Arboretum, Lisle, IL; Nachusa Grasslands in July, The Nature Conservancy, Franklin Grove, IL; video clip of bridge over Willoway Brook in July, Schulenberg Prairie, The Morton Arboretum, Lisle, IL. Dishes are piled in the sink. Freelance work needs completed; evinced by piles of paper and notes everywhere. Unread library books, now overdue, rattle around in the back seat of my Honda. My to-do list now spans several pages. #10: July’s prairie bouquets. 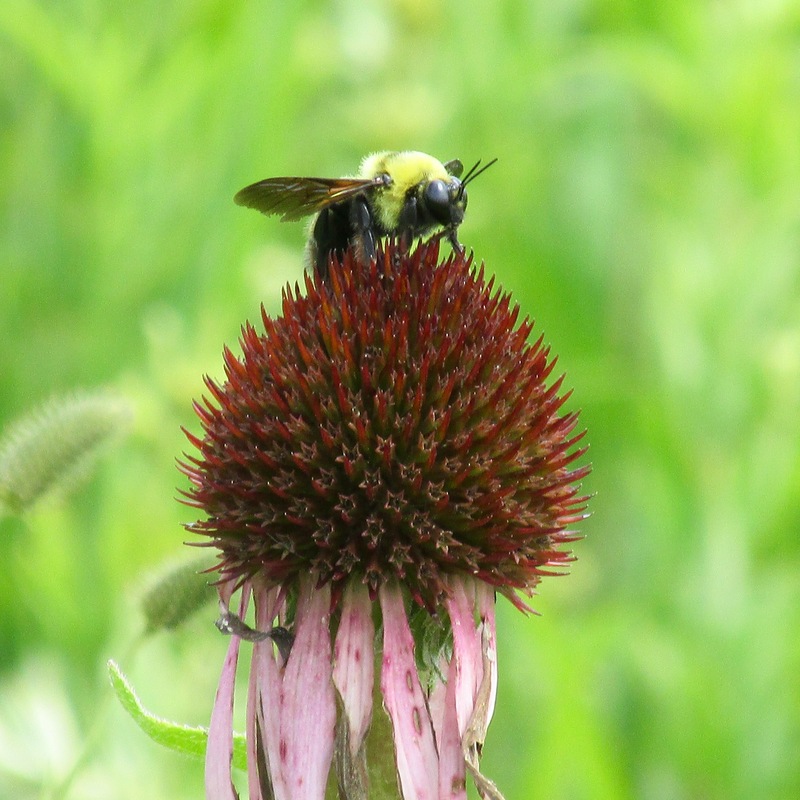 Combine gray-headed coneflower, wild bergamot, and the various white prairie wildflowers. Result? Spectacular. #9. The mesmerizing sounds of a prairie stream. This stream at Nachusa Grasslands was linked to a beaver pond until the beavers abandoned it last season. In only a year, the changes in the landscape are impressive. #8. 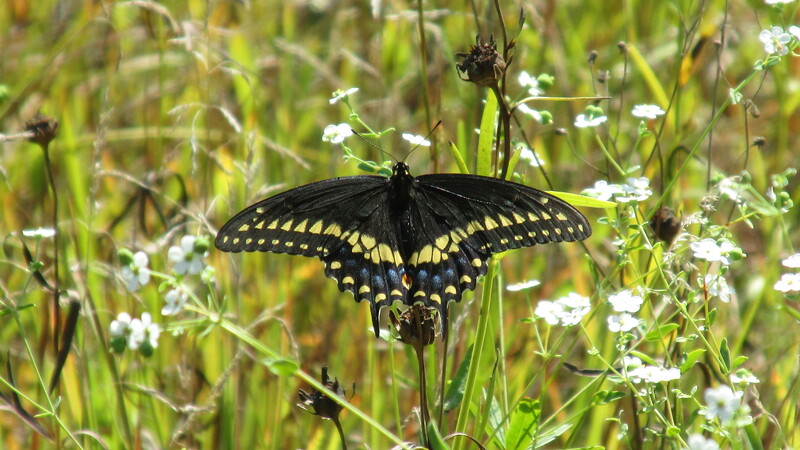 Unbelievably beautiful butterflies float the July prairie, like this black tiger swallowtail. Sometimes you get a bonus: a double dose of fritillaries. #7. 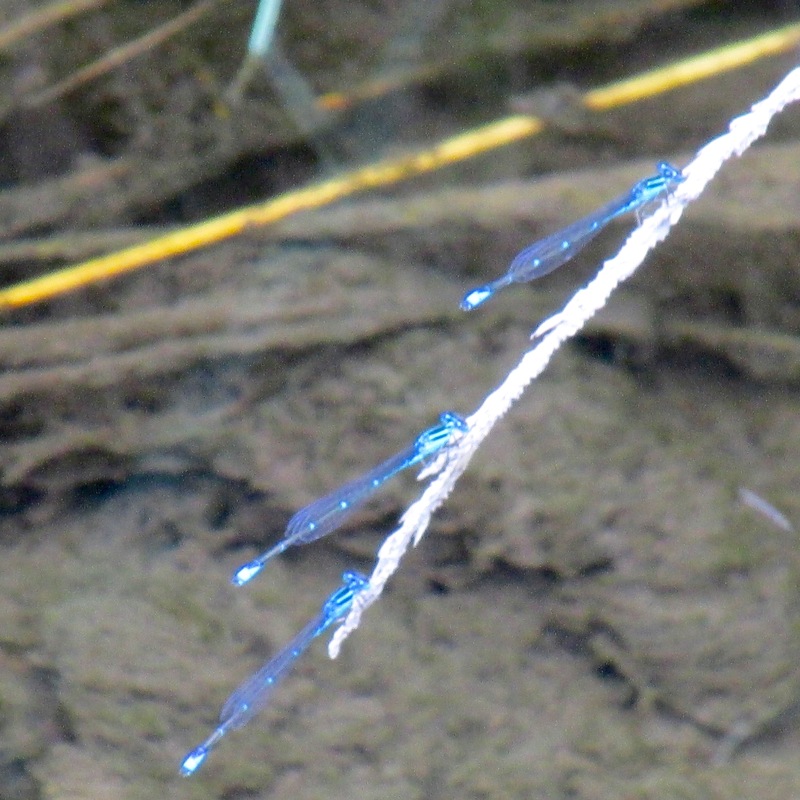 Summer is all about springwater damselflies. This one’s a male. #5. Compass plants send their profusion of periscope blooms across the prairie. #4. The delightful freckled wild horsemint is reason enough to hike the prairie right now. I think the flowers look like the circus came to town. What do they remind you of? #3. 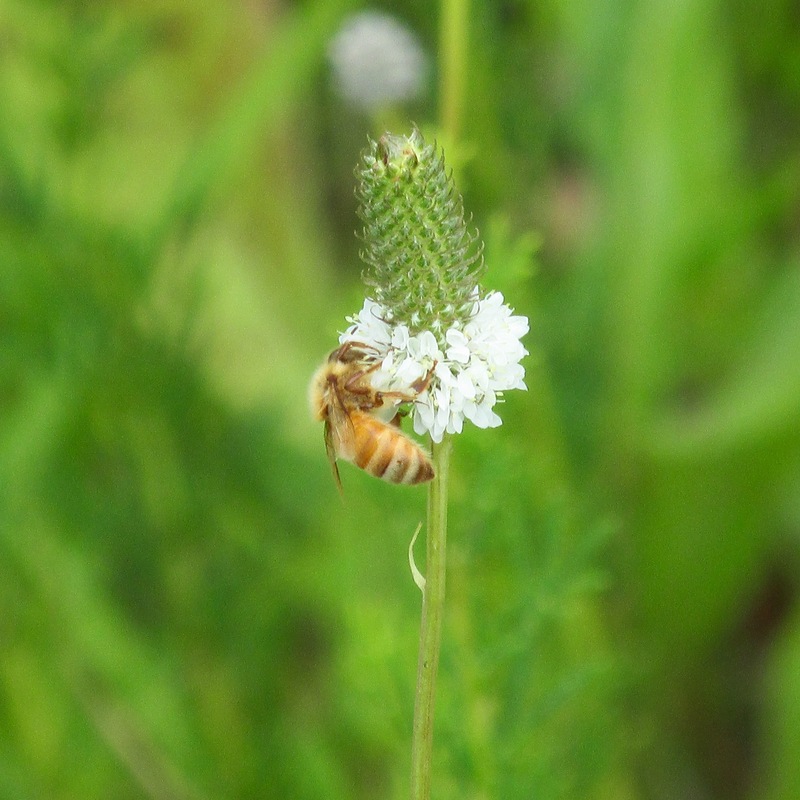 Those July blues…blue vervain, that is. Almost purple, isn’t it? #2. Signs of hope are everywhere. But especially here. #1. And everywhere you look on the July prairie is the promise of future adventures. My to-do list will still be there when I return home. But the July prairie won’t wait. Every day is different. Every day is full of surprises. When I look back on how I spent this day…. …I won’t have any regrets. The opening quote is from Maria Konnikova, whose article “A List of Reasons our Brains Love Lists” from The New Yorker explains these little scraps of paper I have laying around everywhere. Check it out. All of the photos and the video clip this week are from Nachusa Grasslands, a Nature Conservancy site in Franklin Grove, IL, except the compass plants from Fermilab as noted (top to bottom): gray-headed coneflowers (Ratibida pinnata), wild bergamot (Monarda fistulosa), and various white wildflowers; old beaver pond turned stream; black swallowtail butterfly (Papilio polyxenes); two meadow fritillary butterflies (Boloria bellona)–thanks Doug Taron for ID help; springwater dancer damselfly (Argia plana); rough blazing star in bud (Liatris aspera) ; blazing star in bloom (Liatris spp. ); compass plants (Silphium laciniatum) at Fermilab Natural Areas, Batavia, IL; horsemint (Monarda punctata villicualis); blue vervain (Verbena hastata); monarch (Danaus plexippus) on swamp milkweed (Asclepias incarnata); gravel two-track through the July prairie; prairie in my Honda’s rear view mirror. On one side of my desk are precarious stacks of hiking books. Next to them is a list of more books on walking that I’ve lost or loaned out over the years, and now need to beg, borrow, or buy. As I prep for a talk on “Great Hikes in Literature” in a few weeks I already feel a bit overwhelmed by the amount of books on this topic. Books on the Appalachian Trail. Books on the Pacific Crest Trail. Tomes on hiking through America, Alaska, Great Britain, Australia. Fictional quests by the hobbit Frodo for the “one ring to rule them all. ” Children on walking adventures in “The Chronicles of Narnia.” Not to mention all the one-off essays compiled in outdoorsy collections. At the core of these books are central themes: We hike to try to understand something about ourselves. We hike to work through grief, loss, or pain. We hike to make a statement or protest. We hike to find a spiritual dimension in our lives. We hike to challenge our idea of what our limits are. We hike to understand more about the world around us. We go on quests! We hike when we’ve lost our way. When life falls apart, we go for a walk. And sometimes, we just feel the urge to put one foot in front of the other. For as long as it takes. For as far as we can go. When my two kids were teenagers and I was cranky and out of sorts, they’d look at each other knowingly. “Mom, did you go for your walk on the prairie today?” Often the answer was “no!” They could see the difference that a simple hike made. My first big solo hike was 30-plus miles. As I prepared to leave, a friend told me—“I could never do that! How can you be alone with your thoughts for so long?” True words. The greatest enemy of a long solo hike is not fear. It’s listening to your life, without the distractions and white noise that our everyday work pressures and social life mask. Today, I’m hiking the prairie as an observer. Not much of a personal agenda. For those who love wildflowers, I would argue that there is no better month than July to see a wash of electric color across the tallgrass prairies. Lately, drenching rains have alternated with baking heat. It’s brought forth a bevvy of blooms. 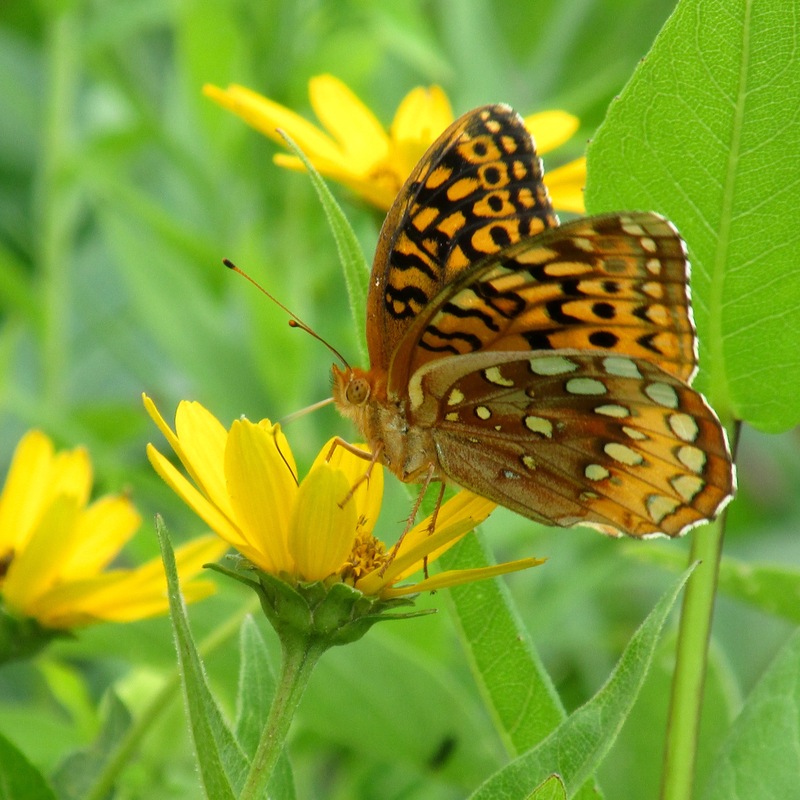 Few people visit the prairie this month because of the high temperatures, humidity, and bugs. It’s true these are issues. Whenever I check the weather report before I go for a walk, I get the same posting. “EXTREME MOSQUITO ACTIVITY.” Well, whatever. That’s what mosquito headnets are for, right? 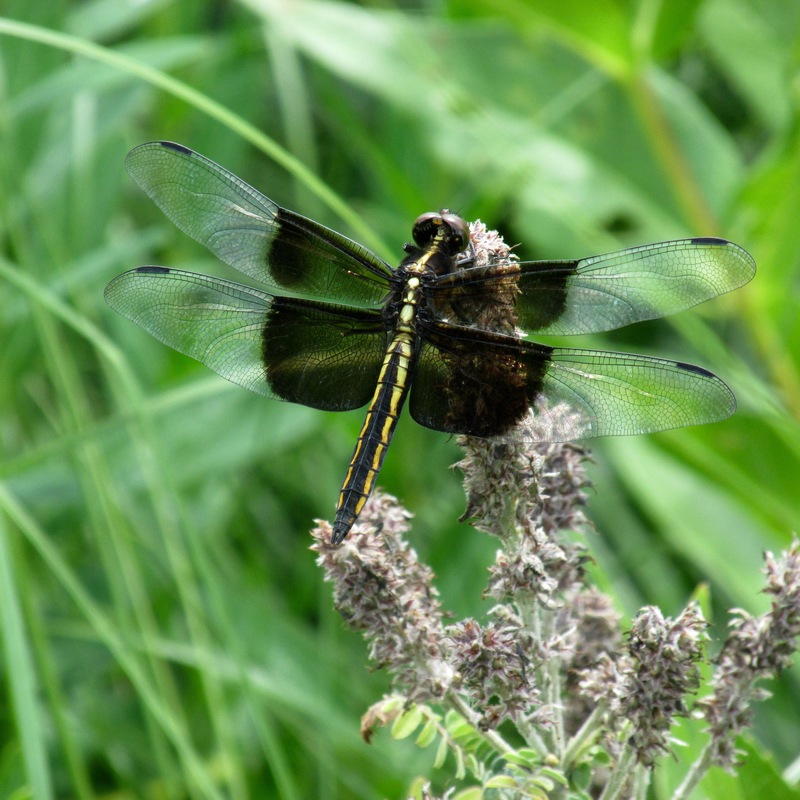 The dragonflies, like this widow skimmer below, appreciate the clouds of mosquitoes in a way I never will. Probably much as we enjoy a mecca of restaurants spread out along the freeway to choose from on our travels. These past few weeks, me and my prairie volunteers are busy collecting seeds. Many of the early spring blooming plants have seeds that are ripe and ready. It’s not easy to find the shooting star seed capsules or cream wild indigo pods under the burgeoning grasses. So green, lush, and high! At the end of a work morning, our backs ache from stooping and searching. Today, I spot some prairie parsley seeds. I pull some, and leave the ones that aren’t quite ready. I pop the ripe seeds into my shirt pocket. Later I’ll put them in a brown paper bag, label it, and leave it in the cool, dark tool room for our staff. Ready to reseed a new prairie restoration. The dry seeds rattling around in my pocket feel like hope for the future. Our pasque flower seeds, collected earlier this season, are in the greenhouse now. We cross our fingers and hope that these notoriously difficult to grow seeds will germinate. If they do, we’ll plant them on the prairie next spring. It’s difficult to remember the joy I felt at the pasque flower’s pale lavender blooms back in April. The first of its delicate color on the prairie. Now, in July, the prairie is profligate with pops of purple. I appreciate this haze of bright color in a different way than I did the pasque flower’s more subtle hues earlier in the season. Walking the tallgrass trails in the high humidity, I notice that the air is saturated with the smell of common milkweed. Surely one of the most underrated fragrances in the natural world! A little prairie aromatherapy. The pink of the common milkweed is more pastel and subdued than the July sunsets, which lean toward the color of neon flamingo yard ornaments. These sunsets grow more brilliant each evening. The crickets and cicadas tune up in the dwindling light as I finish my hike. The temperature drops. I think of the sunset to come and feel peaceful. Quiet. My prairie walks this week aren’t anything epic. They are over in an hour or so, unlike the quests and hundreds-of-miles hikes I’ll be teaching about in a few weeks. I’m not counting my steps, nor am I challenging myself to see how far I can go, or grieving anything particular. But these short hikes are a good reminder of some of the many reasons why we walk. To try and know ourselves. To pay attention. To look for signs of hope. And to continue to marvel at the delights and complexity of the natural world. Zhuangzi is an ancient Chinese writer, who is credited with many parables and sayings. “Zhuangzi” also refers to Chinese text by the same name (476-221 BC) which contains fables and quotes such as the one opening this blog post. The idea of spontaneous, carefree walking is a common theme among these writings. Love to hike? Or do you enjoy reading about epic walks from the comfort of your easy chair? I’ll be leading a lecture and discussion called “Great Hikes in Literature” at The Morton Arboretum in Lisle, IL on Sunday afternoon, August 5, 2018. Click here to register: Great Hikes in Literature. Hope to see you there! All photos copyright Cindy Crosby (top to bottom): stack of “great walks” books, author’s desk, Glen Ellyn, IL; rocky knob, Nachusa Grasslands, The Nature Conservancy, Franklin Grove, IL; compass plant (Silphium laciniatum) bloom, Schulenberg Prairie, The Morton Arboretum, Lisle, IL; rattlesnake master (Eryngium yuccifolium), Schulenberg Prairie, The Morton Arboretum, Lisle, IL; eastern amberwing dragonfly (Perithemis tenera) on Culver’s root (Veronicastrum virginicum), Schulenberg Prairie, The Morton Arboretum, Lisle, IL; bottlebrush grass (Elymus hystrix), Schulenberg Prairie savanna, The Morton Arboretum, Lisle, IL; the Schulenberg Prairie in mid-July, The Morton Arboretum, Lisle, IL; prairie cinquefoil (Drymocallis arguta), Schulenberg Prairie, The Morton Arboretum, Lisle, IL; purple prairie clover (Dalea purpurea) with widow skimmer (Libellula luctuosa), Schulenberg Prairie, The Morton Arboretum, Lisle, IL; prairie parsley (Polytaenia nuttallii), Schulenberg Prairie, The Morton Arboretum, Lisle, IL; purple prairie clover (Dalea purpurea), Schulenberg Prairie, The Morton Arboretum, Lisle, IL; common milkweed (Asclepias syriaca), Schulenberg Prairie, The Morton Arboretum, Lisle, IL; sunset, author’s backyard prairie, Glen Ellyn, IL; pearl crescent butterfly (Phyciodes tharos), Schulenberg Prairie, The Morton Arboretum, Lisle, IL. 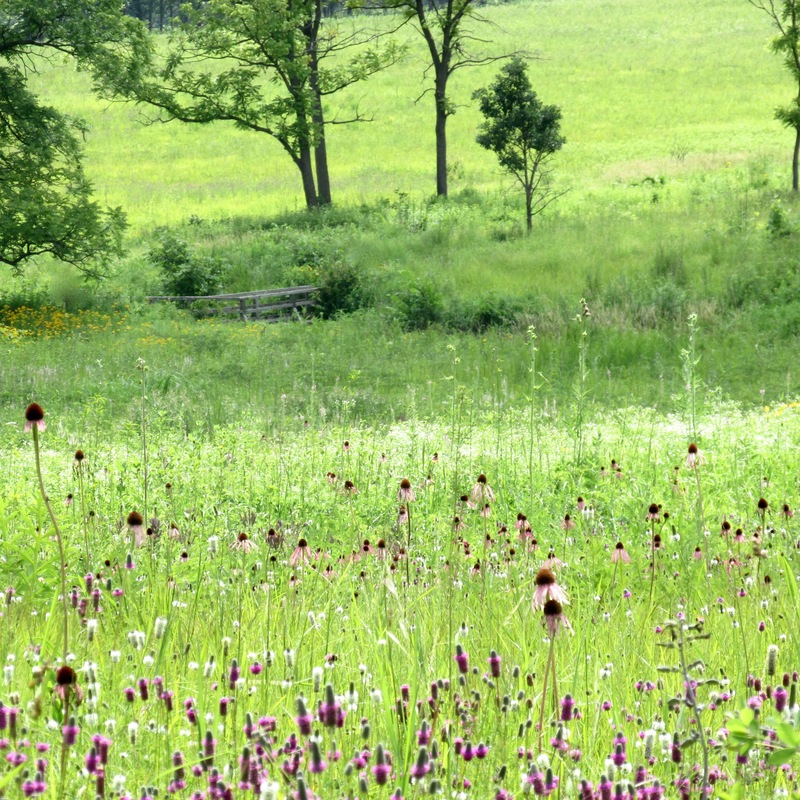 How can we fix a vanishing landscape like the tallgrass prairie in our minds and hearts? It may start with words. Here are a few proposed vocabulary words for this hot July summer on the prairie. A frog hanging out in a pond. When two or more bees visit a flower. 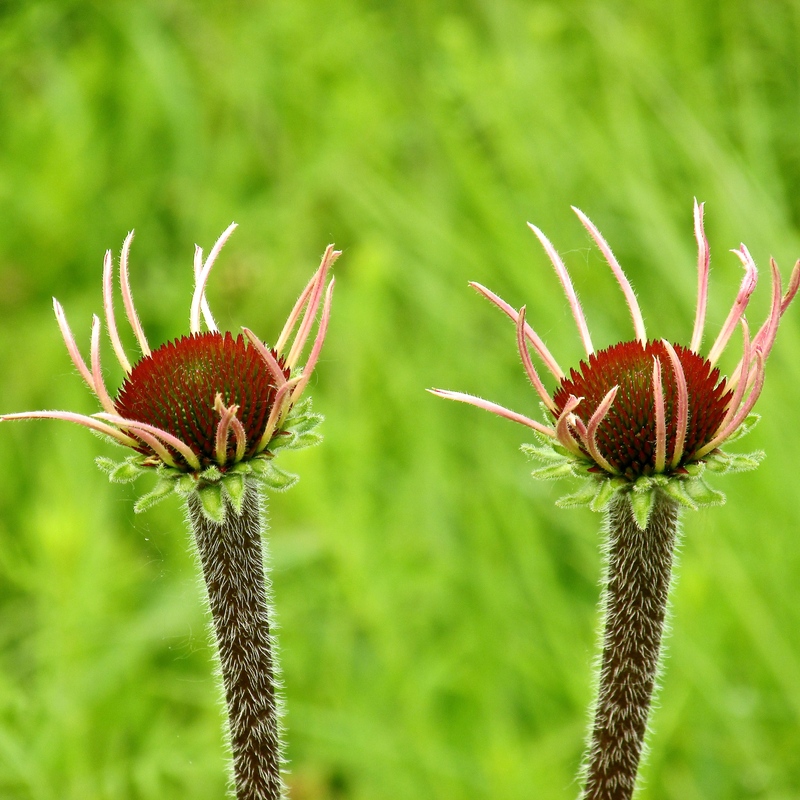 The splotches of color left behind when pale purple coneflower petals fade. What happens when a bison hybridizes with a compass plant. When manmade meets prairie wetland. Any one of the native milkweeds (like this whorled milkweed) that provides life for monarch butterfly caterpillars. Being ignored by a small herd of bison. The July prairie season is in full swing. What new words will you add to our summer prairie vocabulary? Robert Macfarlane’s (1976-) opening quote is from his book Landmarks. In it he reminds us of the power of words, and lists many of the words that have been lost in describing the landscape of the British isles. Read what a New York Times reviewer said about it here. During Fourth of July week, the only fireworks aren’t just in the sky. There are explosions of color as the prairie pours out purple. Twirls and swirls of color. Soft, fuzzy, antennae-like purple, deep in the stamens of moth mullein. Firecrackers of deep purple lead plant, with orange embers. Bees buzzing ’round satellite spinners of purple prairie clover. Lilac bee balm exploding into floral fireworks. Tick trefoil and germander dot the tallgrass with occasional ooohs! and aaahs! of lavender. Violet dancer damselflies send purple aloft, darting here and there in surprising directions; then come to rest in the morning sunshine. Vervain spikes light purple sparklers along the paths. Unlike the noisy fireworks on July Fourth, these purple fireworks explode against a soundtrack of birdsong and wind. A bit of a rest after all that night time noise, isn’t it? Why not see for yourself? Go for a hike today — enjoy the quiet, and the magic of the color purple. All photos copyright Cindy Crosby (top to bottom): mother bison and baby bison (Bison bison) Nachusa Grasslands, The Nature Conservancy, Franklin Grove, IL; the prairie in July, Schulenberg Prairie, The Morton Arboretum, Lisle, IL; purple prairie clover (Dalea purpurea), Schulenberg Prairie, The Morton Arboretum, Lisle, IL; moth mullein (Verbascum blatteria), Schulenberg Prairie, The Morton Arboretum, Lisle, IL. ; lead plant (Amorpha canescens), Schulenberg Prairie, The Morton Arboretum, Lisle, IL. ; purple prairie clover (Dale purpurea) and a bee, Schulenberg Prairie, The Morton Arboretum, Lisle, IL. ; monarda or wild bergamot, (Monarda fistulosa) Schulenberg Prairie, The Morton Arboretum, Lisle, IL; Illinois tick trefoil (Desmodium Illinoense) and germander (Teucrium canadense), Schulenberg Prairie, The Morton Arboretum, Lisle, IL. ; violet dancer damselfly (Argia fumipennis violacea), Schulenberg Prairie, The Morton Arboretum, Lisle, IL. ; hoary vervain (Verbena stricta), Schulenberg Prairie, The Morton Arboretum, Lisle, IL; prairie in July, Nachusa Grasslands, The Nature Conservancy, Franklin Grove, IL. All photos by Cindy Crosby (top to bottom): (July on the Schulenberg Prairie, The Morton Arboretum, Lisle, IL; yellow sulphur butterflies puddling on mud, Nachusa Grasslands, Franklin Grove, IL; dickcissel, NG: fritillary, SP; bumblebee on pale purple coneflower, SP; reversed haploa moth, SP; 12-spotted skimmer dragonfly, SP; trio of damselflies, SP; black swallowtail on flowering spurge, NG; common sooty wing butterfly on tall coreopsis, SP; widow skimmer dragonfly on leadplant, SP; honeybee, SP.